Top Rated Local® is pleased to announce that Olaru’s Premier Tax Services is a 2018 award winner for accounting firms and CPAs in Washington! If you’re in need of accounting or tax preparation services in Vancouver, Washington, there’s no better company to turn to than Olaru’s Premier Tax Services. Olaru’s Premier Tax Services has earned dozens of online reviews with an average rating of 5.00 stars, a stupendous Rating Score™ of 96.00 and a 2018 Top Rated Local award for being ranked among the top 10 accounting firms and CPAs in all of Washington! Many of the clients that Olaru’s Premier Tax Services works with have never had their tax returns reviewed with them before. They typically have just signed and were told the balance they owed. That’s not the kind of experience clients get at Olaru’s Premier Tax Services. At Olaru’s Premier Tax Services, they take the time to really get to know their clients, so that they can help them find the right solutions for their needs. They are also highly focused on continuing education, and they work with many other firms to work through unique client situations. Olaru’s Premier Tax Services also utilizes software that makes it easy for clients to provide them with necessary receipts. This makes for a much easier process for clients going through audits, and it lowers the chance of having deductions denied by the IRS. If an audit finds that deductions weren’t allowed, it could mean penalties and interest for as many years back as the client was audited, and for some people, those penalties can be large. Yuliya Olaru, the owner of Olaru’s Premier Tax Services, is a part of the Vancouver Chambers and the Columbia Professional Alliances, which allows her to offer more services to her clients. Yuliya credits her company’s strong online reputation to their willingness to ask their clients for reviews. They also post a lot of useful information on their website and in their blog, and they encourage their clients to utilize that information. Word of mouth has been the biggest source of growth for Olaru’s Premier Tax Services. They also offer promotions to get new clients in the door, including a 10-percent discount on any first-time consultation and $50 off for filing with them for the first time. 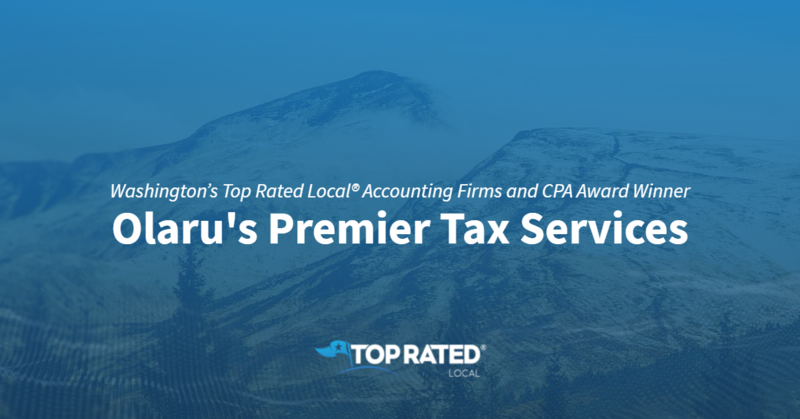 Congratulations to the team at Olaru’s Premier Tax Services for being a 2018 Top Rated Local award winner, and thank you so much, Yuliya, for taking the time to speak with us! If you’re in need of tax services, we highly recommend Olaru’s Premier Tax Services. Visit their website today.